In an effort to fill all remaining open spots, we’ve extended the registration deadline for our AESES Fall 2018 Education Seminars. Open spaces will be filled on a first come, first served basis, until full. Guided Downtown Public Art Tour – Sunday, September 23. 1:30-3:00pm. $2 for members/$12 for non-members. 11 spaces. Smartphone Photography – Monday, October 1. 6:30-9:00pm. $5 for members /$15 for non-members. 3 spaces. Gluten and Dairy-Free Baking Demo – Sunday, October 28. 2:00-4:00pm. $15 for members /$25 for non-members. 5 spaces. Gluten and Dairy-Free Baking Demo – Sunday, November 4. 2:00-4:00pm. $15 for members /$25 for non-members. 4 spaces. Overcoming Anxiety – Thursday, November 1. 6:30-8:00pm. $2 for members /$12 for non-members. 10 spaces. 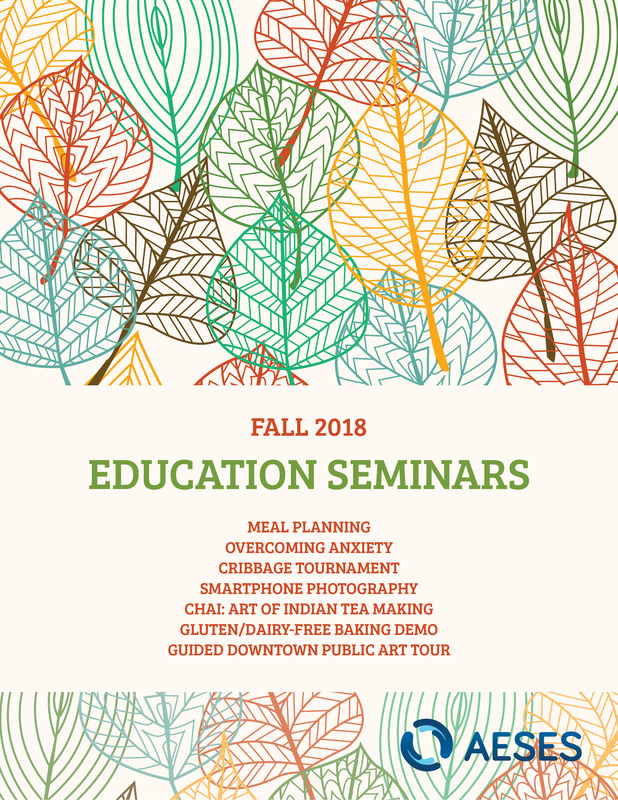 Chai: The Art of Indian Tea-Making – Friday, November 16. 7:00-9:30pm. $15 for members /$25 for non-members. 3 spaces. Cribbage Tournament – Wednesday, November 21. 7:00-9:00pm. $5 for members /$15 for non-members. Between 3 and 23 spaces. ​Interested in participating? Fill out the updated registration form and submit it to the AESES Office (via interdepartmental mail), along with your payment. We’ll then send out confirmation emails once your spot has been confirmed. The last date that we will accept registrations is October 12, 2018. This entry was posted on Tuesday, September 11th, 2018 at 9:27 am and is filed under News Feed.